paul gregutt's washington wine blog – unfined & unfiltered: are these the best budget sparkling wines in the northwest? are these the best budget sparkling wines in the northwest? 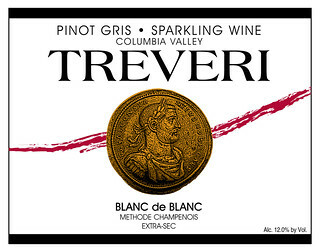 Based on where their wines are being served – my recent Wine Writer Dinner at Walla Walla Community College, and, oh by the way, at the White House – Yakima-based Treveri Cellars is off to an excellent start. German-born and educated winemaker Juergen Grieb has been working with Washington grapes since the early 1980s. He was brought here shortly after taking his enology degree to work with the now-defunct Langguth winery, an early riesling project on the Wahluke Slope. I first encountered the Treveri Brut as part of a lineup in a blind tasting of vintage Champagnes. Someone had slipped it in as a ringer, so there was no clue that it was neither vintage nor Champagne. Amazingly, it showed very well, better than several of the pricier bottles in the flight. In my own tasting, I put the more traditional Treveri wines in a mixed flight of sparkling wines from a number of New World producers. Once again the Brut was the standout, a rich and creamy wine, elegantly styled. Made from chardonnay grapes, it retails for $14. The Extra Brut (drier still) was quite well made, in a crisp, lightly melony style well-suited to oyster-slurping. But that’s just the beginning. Grieb makes sparkling wine out of a wide range of grapes, including riesling, gewurztraminer, pinot gris, Müller-Thurgau and syrah. They run up the sweetness scale from extra brut through brut, extra-sec, sec, and demi-sec, but all are soundly made and attractively priced. Perhaps I am biased, but I don’t find that any sparkling wine from non-standard grapes can match the elegance and depth of those made from chardonnay and/or the black grapes – pinot noir and pinot meunier. But if I had to choose a favorite from the rest of the Treveri offerings, it would be the Gewurztraminer Demi-Sec Blanc de Blanc, a sweetly floral, intensely perfumed sparkler. Look for it at your next White House dinner. New World producers need to stop using protected terms. Methode Champenoise in the EU is limited only to Champagne. Other regions are only entitled to use the term Method Traditional. We should follow as well. Well, this particular tasting group includes more than a half dozen winemakers, myself, and several others who taste wines constantly and have cellars stocked with some of the best in the world. I must applaud you, Anon, for having a palate that clearly is in another dimension than any of ours. Exciting news is that Treveri opened their second tasting room in the old Sagelands Tasting facility off I-82 south of Yakima today (4-27-12), just in time for Spring Barrel tasting. I bet they will get lots of weddings and parties there...a perfect match for their sparkling wines.